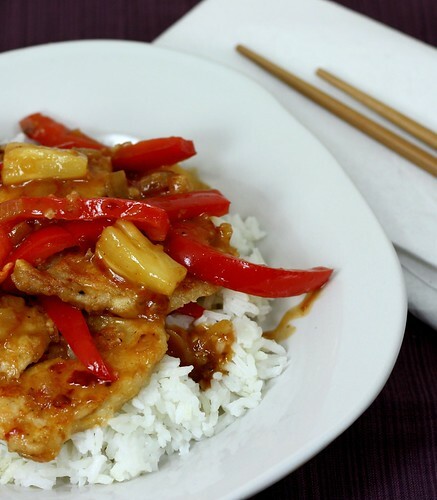 Spicy Pineapple Chicken – Elly Says Opa! This dish is (sort of) a riff on a PF Chang’s recipe, but I’ve never actually eaten at PF Chang’s so I can’t tell you whether or not it compares. What I can tell you is that it doesn’t really matter either way, because I loved it. 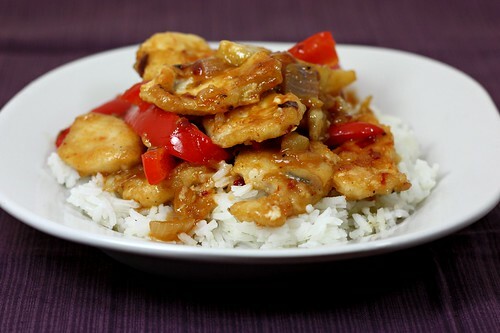 It’s pretty easy to love a meal with crispy chicken and a spicy-sweet sauce, particularly when it comes together quickly. Toss in any vegetables you want, add some rice, and you have a complete meal. The chicken gets nice and crispy because it’s dredged in cornstarch and pan-fried in oil. I’m not really into deep frying often, so I just put enough oil on the bottom of a nonstick pan to get the chicken cooked and crisp, without overloading it with fat and grease. Slicing the chicken rather than cutting it into cubes also works better for this, because it takes less time to cook through. I ended up using Sambal Oelek in this since it’s a staple in our house and I wasn’t really sure what “chili sauce” was, to be honest (My mind conjured up images of the Heinz bottle, but that didn’t seem appropriate in this recipe). It worked really well and gave this dish a nice kick. Obviously, use more or less to suit your spice preference. I’m happy to report that this meal will definitely be a repeat in our home. To make the sauce, whisk together the pineapple juice, chili paste, vinegar, sugar, soy sauce, water and cornstarch. Set aside. Toss the chicken with the cornstarch until well-dusted. Add enough oil to a large nonstick skillet to coat the bottom (with a little extra). Once hot, add the chicken and cook on both sides, until completely cooked through. Remove from the skillet. Add a small amount of additional oil to the skillet if necessary, and then sauté the onions for about 2 minutes. Stir in the bell pepper and garlic and cook about 1 minute. Stir in the sauce and bring to a boil. Simmer for 3-5 minutes, until thick, adding the chopped pineapple during the last minute. Remove from the heat and add the chicken back in, tossing to coat. *Pineapples aren’t really in season at the moment, so I bought a can of tidbits in their own juice. I pureed enough so that I would get 1 cup of pineapple juice (I did push it through the strainer) for the sauce and then used 1/2 cup of drained tidbits for the chicken.